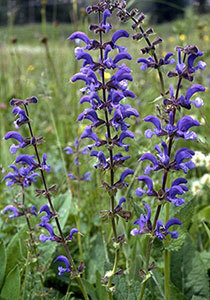 A project by NRW, National Botanic Garden Wales, Bristol Zoo and Treborth Botanic Garden to bring back the Meadow Clary plant (Salvia pratensis) from extinction in the wild Wales at a site in Monmouthshire. Six plants from Treborth stock taken to Bristol Zoo for cross fertilisation with plants from Gloucestershire – then to National Botanic Garden to Natasha De Vere. 24 plants were taken from Treborth to Rectory Meadow in Monmouthshire for reintroduction. Monthly monitoring to assess growth, grazing pressure and slug damage.